Card, sent from Aseri The nice picture-side: see Tallinn. The post-office is opened April 11, 1921. 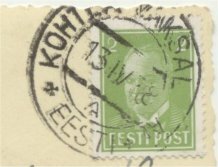 This postmark has Roman numeral for the month and EESTI between the circles, so it is according the EESTI-handbook the type 15B. The type has also a sub-division and this is type 15B4: with two Maltese crosses, index-letter A. It is the only reported postmark of Aseri. Aseri (Estonian: Aseri vald) is a municipality in the County Ida-Virumaa, norteastern Estonia, on the coast. The parish has -according Wikipedia- 2238 inhabitants (2005). 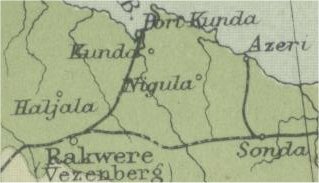 Detail of map Times Atlas 1920. This card is sent from Elva. The picture is a building in Tartu and Elva is located in the county Tartu, something south-west of the city Tartu. 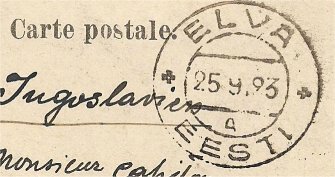 The post-office of Elva, opened November 23, 1918, has used three other postmarks, all type 15B, with the month in Roman numerals. In Käina a post office is opened December 2, 1918 under the name KEINA. This post office has used three different postmarks and is closed June 30, 1934. The post office is reopened as KÄINA July 1, 1934. 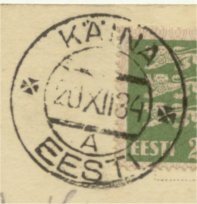 On the card here is used a postmark of Käina, according the EESTI-handbook Type 15B Date-stamps of the Estonian Post (month Roman numerals) with indexletter A: subtype B4 (clearly Maltese crosses between circles). Käina is a small borough (alevik) in Hiiu County in Estonia. It's the administrative centre of Käina Parish. Hiiu County consist of Hiiuma, the second largest island of Estonia, and some small islands. The island Hiiuma, old German/Swedish name Dagö, is located north of the island Saaremaa in the Baltic Sea. 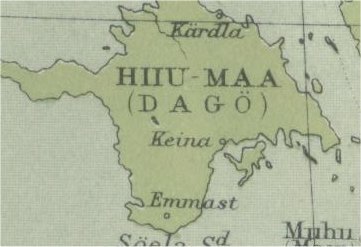 Detail of map Times Atlas 1920: Käina indicated as Keina. 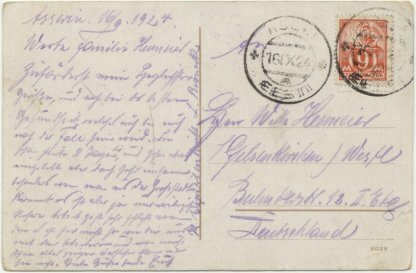 A letter from Kihelkonna. The post-office of this place is opened February 2, 1918. It is a very little parish,according Wikipedia 891 inhabitants (in 2006). The municipality is part of the Saara County, the island Saaremaa. 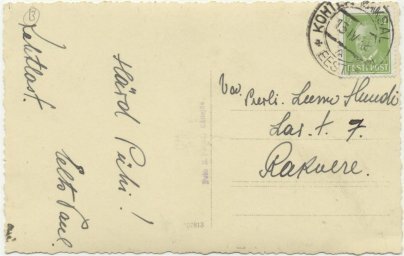 This postmark is from 1924 and an Estonian circle date-stamp, month in Roman numeral, and Maltese crosses, so type B4 of the handbook. Here code 'B', but also code 'C' is used. 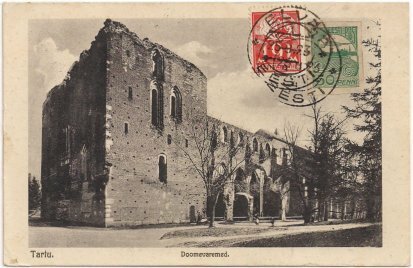 There are two provisional postmarks of this place used in 1919: a double circle date-stamp with Russion place name and a single -line stap with capital of the first Letter. 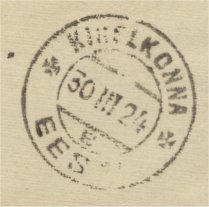 After these postmarks are used Estonian double circle cancellations, first a former Russian date-stamp, code 'A', month in Arabic numerals and 'EESTI' between circles. In the handbook type A1. 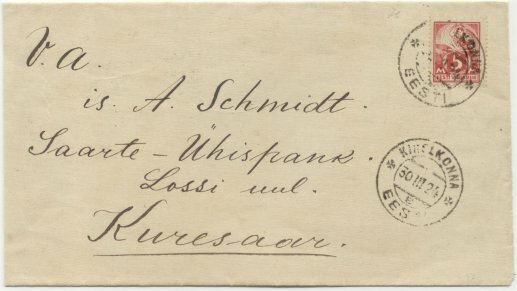 Later the type above on this letter. 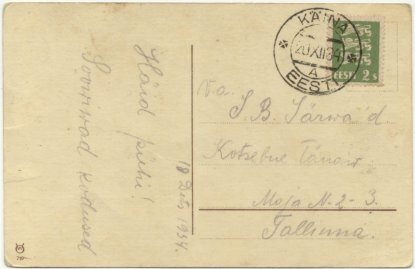 The name Kohtla we can find in three post-offices in north-east of Estonia: Kohtla (opened April 25, 1927), Kohtla-Järve (opened Februart 22, 1923) and Kohtla Vaksal. This is an Easter-card, sent from Kohtla Vaksal, Kohtla-railway-station. According EESTI Kohtla-Vaksal is opened March 1, 1923, and closed June 30, 1934. Then re-opened on July 1, 1934 as Kohtla Vaksal. This post office Kohtla Vaksal has used only one postmark: type 15B1AG, serial letter A. The postmark has the month in Roman numerals and two crosses between the circles, type 15B1, and it was an Agentuur, Postal Agency: this is indicated in the postmark as 'AG'. 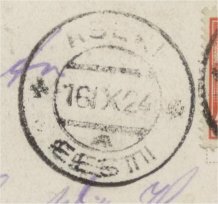 The earlier postal agency Kohta-Vaksal has also used one postmark, type 15B4AG, with two Maltese crosses and serial letter A. The railway station is opened in 1876, on the line Tallinn-Narva, now in the place Kohtla. In present Estonia there are two kinds of municipalities: rural (parishes) with the indication 'vald' and urban with the indication 'linn'. The station is part (? not sure) of Kohtla, in Estonian Kohtla vald (in 2005 only 1496 inhabitants), located on the sea. More southward, partly enclosed by Kohtla, is located Kohtla-Järve, in Estonian Kohtla-Järve linn 46.032 inhabitants in 2005). Wikipedia Ida-Viru municipalies. The main parts of Kohtla-Järve are located about 10 km apart. In Soviet time Kohlta-Nõmme was also part of this (urban) municipality. The city has, according Wikipedia, a unique lay-out: districts scattered across the northern part of Ida-Viru county.